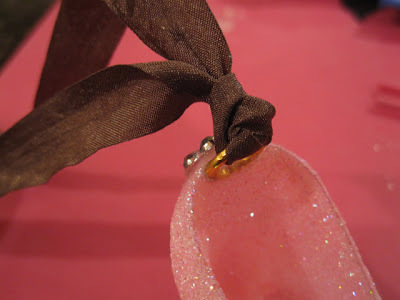 I love girly ornaments! Sparkly and sweet - this cute little shoe ornament is perfect for the "Shoe Queen" in your life....or perhaps you are a "shoe queen"??? I know I am! They are easy to whip up and can be customized to any colors. Create a hanger by, attaching a large jump-ring to the inside back of the shoe. Make sure at least 1/2 is sticking out over the shoe. Gather your glitter and Mod Podge supplies. 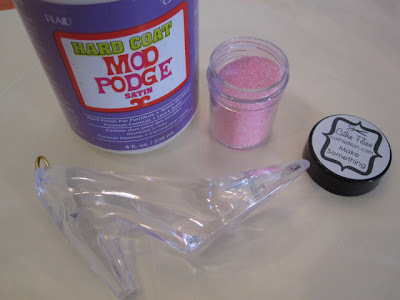 Brush the Mod Podge onto the shoe. 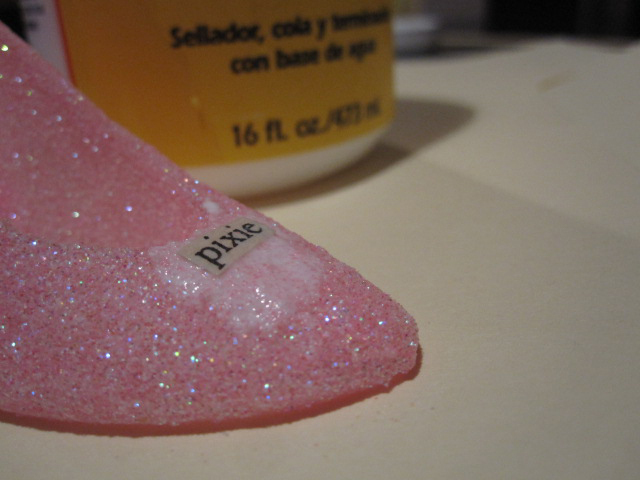 Sprinkle glitter onto the shoe. I like to do this over a file folder. The folder collects the excess and I can easily pour it back into the jar. 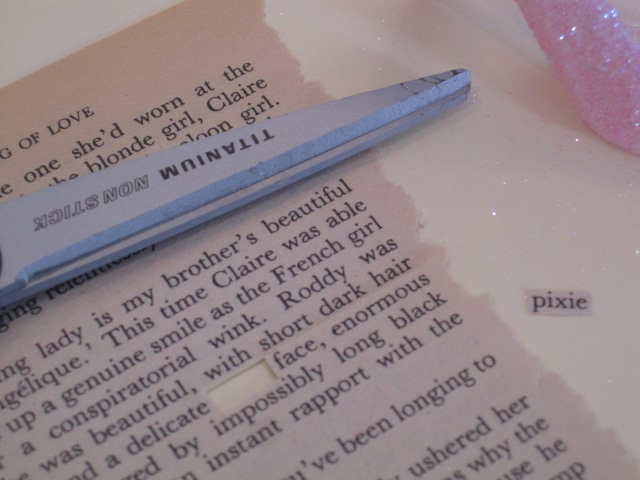 Cut out the word of your choice from a book page. Apply a coat of Mod Podge to the the front of the shoe. 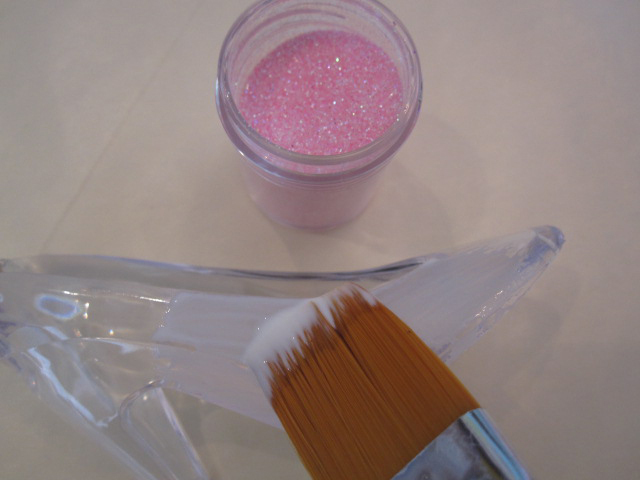 Place the cut out into the Mod Podge and top-coat with a layer of Mod Podge. Allow to dry. 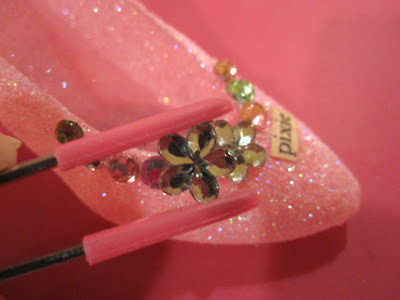 Hot glue gems to the front of your shoes. Use the HGGH tweezers so you don't burn yourself. 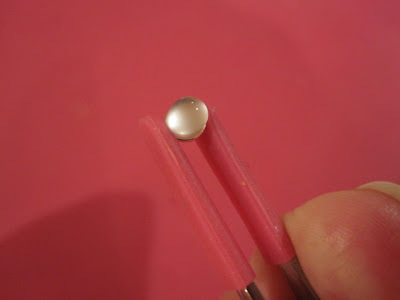 Hold the gems in the twezzer and apply the hot glue to the back. Hot Glue a gem to the back. Tie a ribbon hanger to the end. I love this idea!!! So simple and beautiful!! I know I have one of those little plastic slippers around here somewhere!! I'm going to try this! Thanks Cathie!! NEVER thought of Mod Podging a glass slipper. Great idea girl!! OH MY! I will definatly have to make one of these for a young friend of mine who loves shoes. 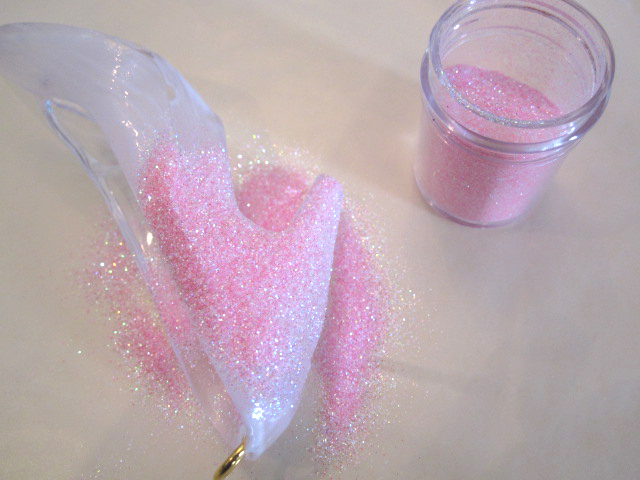 And I have some of your glitter to make it with too. Thanks for this great inspiration! Love it!!! I love this and am pretending I am going to get a jump start on next year's ornaments. Looking for glass slippers online i am seeing a few different sizes. I don't want tiny barbie doll size, of course, but can't decide if the others are too big. What size is yours? Is one 5.5 inches too big? Sorry... can't get proportions in my head between your pics and the pics of the various slippers. Thanks for your help! Love this idea! This reminds me of the glass slippers we buy at Dollar Tree in the wedding section in a package of 6 for $1.00. 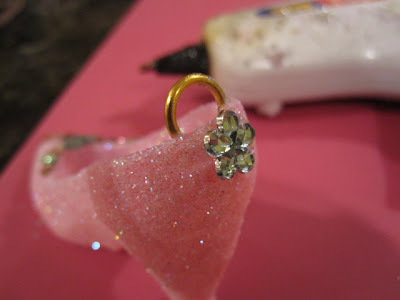 Hot glue works well to glue ribbon for a holder and the embellishments on the shoe. We use trims and bows for ours but I will certainly try this method. I love the pink color and the word and embellishments you used are darling. 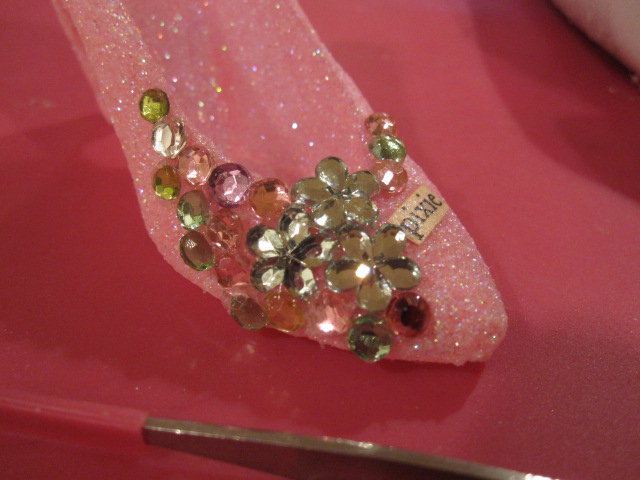 My granddaughter loves her tree with the glass slippers on it so I'm sure this will be a big hit for any little girl. Thanks for sharing a different way to make these. 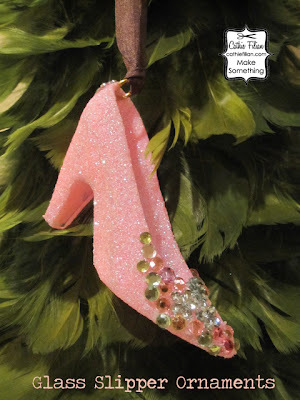 Where do you find a glass slipper? I want to do these for Christmas tree.. I have seen them at wedding supply shops too! The shoes in my shop are 3.25" long, 1.25" wide, 2" tall.